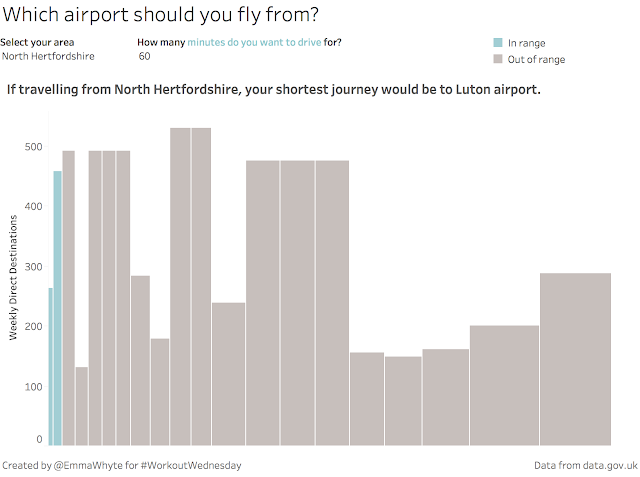 #WorkoutWednesday week 36: Which UK airport should you fly from? I'm trying out some new chart types in this week's Workout Wednesday. Recently Tableau introduced the ability to create variable width column charts (sometimes called skyline charts - because they can look like a city skyline). I wanted to get an appropriate and interesting data set for this challenge. I found some data on journey times to UK airports from Lower Super Output Areas from data.gov.uk. Pretty interesting! I supplemented that by joining on lookup tables to aggregate the data up to local authority level - something most people in the UK would recognise as a geography. I also added some additional data about the airports - numbers of passengers and destinations. Your challenge this week is to use the data set to re-create this skyline chart. That's it! Good luck and when you're done remember to post a picture of your finished viz to Twitter and tag @EmmaWhyte and @VizWizBI with the hashtag #WorkoutWednesday.